The poster for Chapter 3 of the serial. 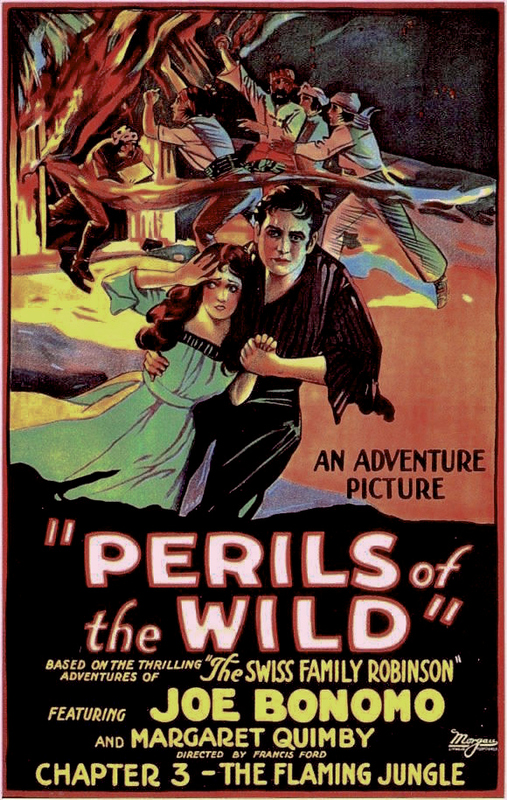 Perils of the Wild is a 15 chapter serial released in 1925 by Universal Pictures and directed by Francis Ford. 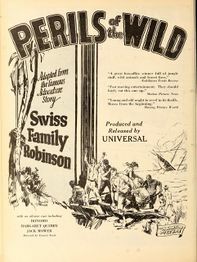 The serial was the first film adaption of the Johann Wyss's novel The Swiss Family Robinson. Actors/Actresses that performed in the serial were Joe Bonomo, Margaret Quimby, Alfred Allen, and Boris Karloff (of Frankenstein and How the Grinch Stole Christmas fame). Perils of the Wild takes the same basic structure as Johann Wyss's novel but adds an entirely new storyline to make it stand out. In the serial, the Robinsons are marooned on an island (based on the island in the novel). 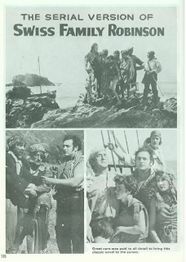 Accidentally though, the family stumbles on a hideout of a gang of pirates led by Captain Black John (played by William Dyer). Judging by the surviving stills, the Robinsons try and successfully make off with Black John's treasure chest (the chest is the MacGuffin of the serial), which sets off the action part of the serial. Not much else is known about the plot of Perils of the Wild. During the filming of the serial, lead actor Joe Bonomo suffered a fractured leg and an injured sacroiliac (joint in the pelvis). He would perform his own stunts, not by using a stunt double like most actors. 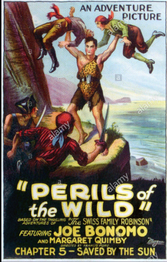 As a consequence of his injuries he sustained, he was forced to drop out of another serial, Tarzan the Mighty. During the filming of the serial, lead actor Joe Bonomo suffered a fractured leg and an injured sacroiliac (joint in the pelvis). He would perform his own stunts, not by using a stunt devil like most actors. As a consequence of his injuries he sustained, he was forced to drop out of another serial, Tarzan of Terror. The serial was debuted on August 27th, 1925, though some sources say that the film could have been released as far as August 1st, 1925. Reviews of the serial came out as "fairly good", but audiences may have not been so quick to think about that because of its unconventional setting. 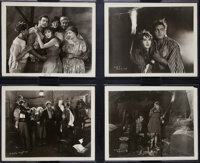 The film was most likely scrapped in 1948, as most of Universal's silent films were getting rid of. As of January 2019, there is no surviving footage of the serial. However, there are stills and posters of the serial floating online. On January 1st, 1968, the lead actor, strongman Joe Bonomo wrote an autobiography titled Joe Strongman: A True Life Pictorial Autobiography of the Hercules of the Screen. In the book, there are stills from the movie, as well as information behind the scenes. A full page ad for the serial. A page from Joe Bonomo's autobiography, which contains stills from the serial. A poster advertising episode 5 of the serial. Some stills from the serial.